Clipper is the make. wear. love. fall 2017 retreat design for the ever-fantastic Indigodragonfly. 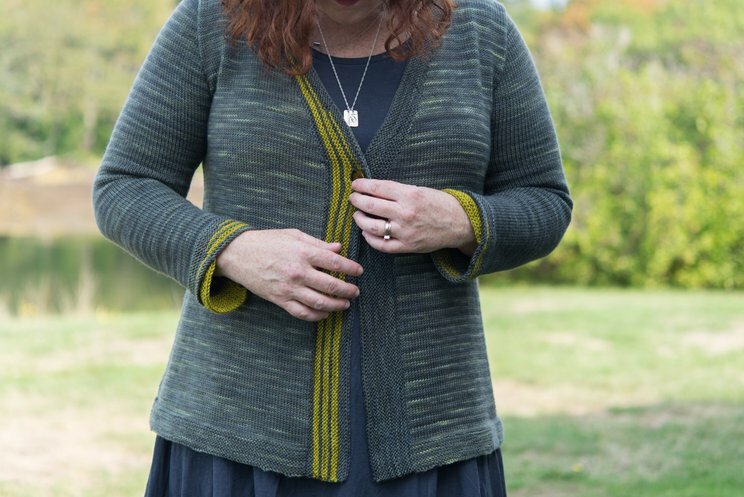 Kim is an incredibly inspiring friend to have, and this cardigan gives a nod to her love of asymmetry - the short-row detailing on the sleeve cuff and button band are asymmetrical. 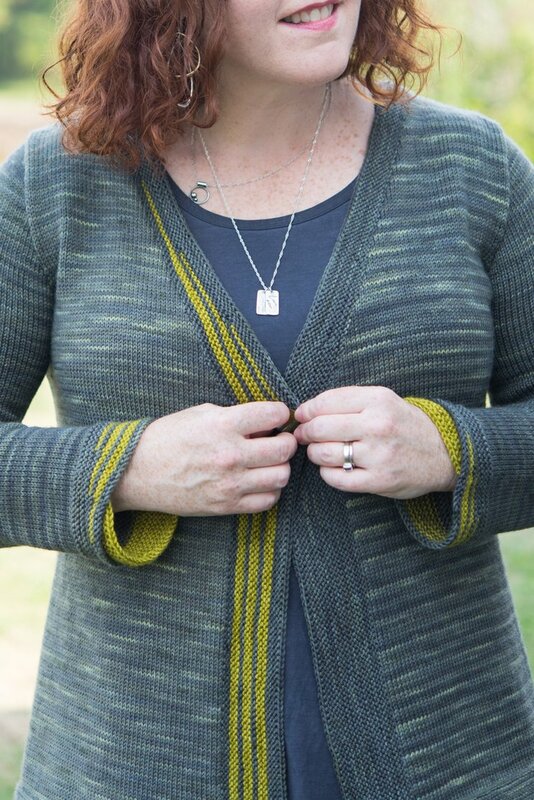 Its worked up in DK Matter in special retreat colorway "Hand of the Herzog" with "Tapenod" as a CC. 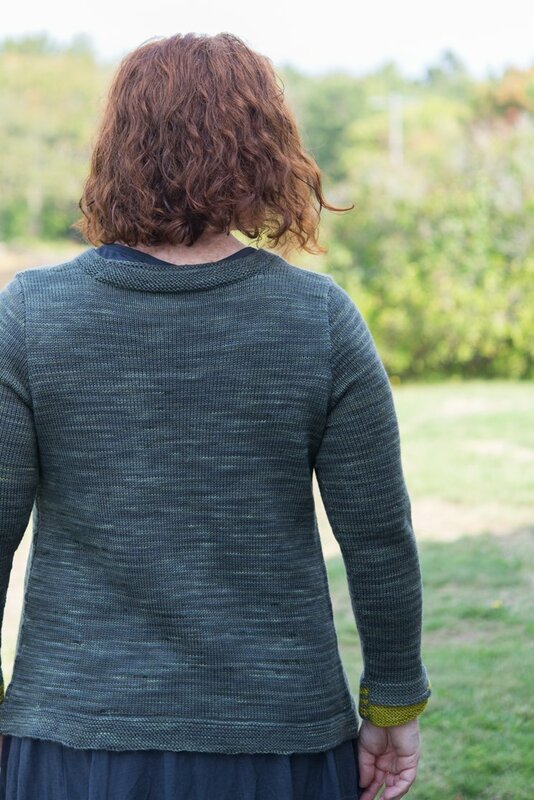 It features garter stitch trims, a deep V-neckline, and I've shown it here in an A-line silhouette. The sleeves are both worked alike, which causes the curved contrast-color piece of the cuff to be on the front of one sleeve, and on the back of the other. 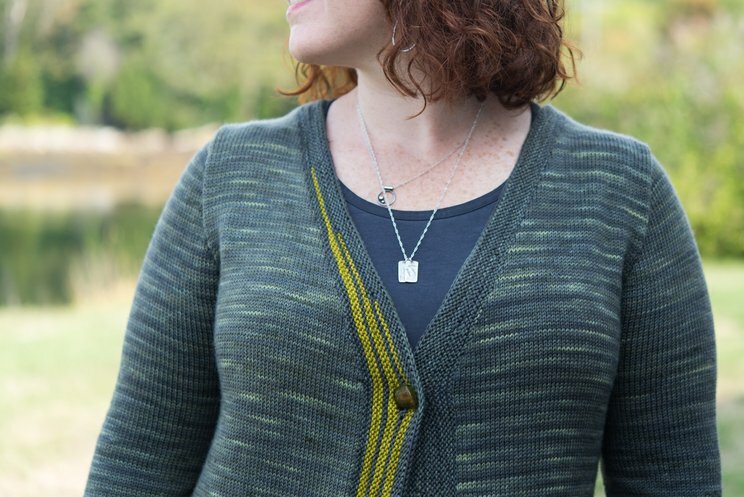 The button band is also worked in an unusual way, in two pieces with overlap at the back neckline. Only the Right Front neck piece is worked with CC wedges; the Left Front is worked entirely in MC. If you'd prefer a more sedate cardigan, you can definitely eliminate the CC (or even the short rows!) entirely. Pictured in a-line silhouette. Also available in hourglass, straight, and tapered silhouettes. Please see our page on silhouettes for a full explanation of silhouettes in Customfit. 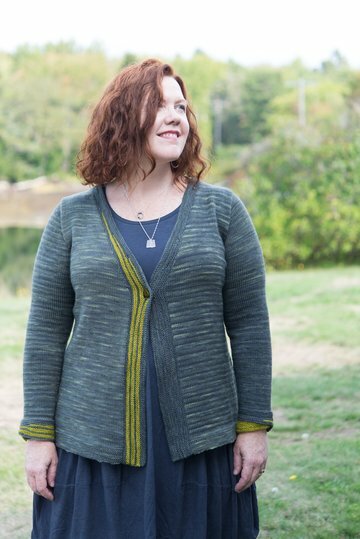 A standard size 30 (32, 34, 36, 38, 40, 42, 44, 48, 52, 56, 60)’’ sweater, with DK matter worked at a snug gauge of 6 stitches to the inch, will require takes 5 (5, 6, 6, 6, 7, 7, 7, 8, 9, 9, 10) hanks of DK Matter (shown in "Hand of the Herzog") for the MC and a single (partial) hank of CC (shown here in "Tappenod"). Silhouettes: Pictured in a-line silhouette. Also available in hourglass, straight, and tapered silhouettes.